Levoca, Spissky and the Associated Cultural Monuments comprise a group of religious, military and civil medieval buildings that have integrally survived. Spissky Hrad (Spis Castle) dates from the early 13th century and is the biggest surviving castle of Central and Eastern Europe. 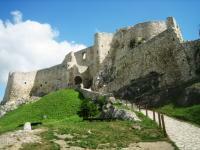 It is strategically located on a limestone hill and was originally built as a defence against Tatar invasions. In later centuries it has seen many additions and alterations. The castle has both Romanesque and Gothic elements. It burned down in 1780 and is now in ruins. During the WHC session of 2009, the town of Levoca was also added to this WHS. It is particularly known for the polychromatic wooden masterpieces of Master Paul, which are characteristic of the Late Gothic. They include Europe's highest altar (dated ca. 1520). This for sure is the most popular tourist attraction in Slovakia. There’s a large car park, a 135 SK entree fee, souvenir shops and you can get drinks and snacks at the inner castle courtyard. Be aware though that like many other sights in Slovakia it is closed between the months of November and April. You’ll have to make do then with the majestic view of it from across the surrounding plains. Which possibly is the best part of the visit anyway. For those who can get in it is wise to wear sensible shoes. First there's the uphill walk to the castle itself, and its interior isn't paved either. It's kind of a climbing experience because it's just all ruins. It is possible climb the remaining residential tower. Some of the best preserved rooms at the back hold a little museum with the usual medieval castle displays of canons, guns and armour. There's also an original chapel. I didn't visit any of the towns inscribed together with the castle (bit fed up with churches), but chose Levoca instead. This city about 15kms away is currently proposed as an extension to the Spis WHS. Its central square has a definite Italian flair because of the many Renaissance buildings. But what I really came to see is its remarkable wrought-iron "Cage of Shame". This is were the local 16th century Protestants kept their women that wouldn't behave! Without a doubt, Spissky hrad is a spectacular sight, the castle built of white travertine and towering on a green hill is a popular photo subject from every side and angle. But in fact, the view of the castle is the best part of the visit. 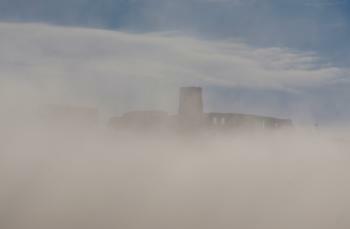 The photo shows the view from Spissky Kapitula in the morning when the fog was clearing. The castle is a large complex with several courtyards on the terraced grounds. I can imagine that in former times the fortifications were deterrent and impregnable. Today the castle is in ruins, it was destroyed by a fire in the 18th century and only parts of the central area are accessible. There is a museum and a chapel, both not very exciting, instruments of torture, arms and armour are shown. A model in the museum gives an idea of the former splendour of Spis Castle. You get a good view of the structure of the castle and the Spis landscape from the castle tower. We laughed when we saw the warning on the door of the tower: "Pay Attention! Flying Ants! ", but it was absolutely justified, at least during our visit in August. From the tower you can see the diocesan town Spisska Kapitula on the opposite hill. This WHS is also a symbol of the interdependencies of secular and ecclesiastical power in the Middle Ages. The hill of Spisska Kapitula is lower than the castle hill, but certainly the religious authority was not less powerful. The St. Martin's Cathedral is the main sight of the small fortified town, it can only be visited with a guided tour (hourly in summer, takes about 30 min). The interior has several carved altarpieces, but you don't miss much if you skip a visit. We stayed in Levoca in a hotel on the main square (Hotel U Leva), that was a good choice, Levoca is a lively town, there are several restaurants and cafés on the main square where you can sit outside. 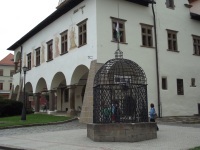 It was a pleasant change to Bardejov which we visited the day before. The main square is dominated by the Old Town Hall and the Cathedral St James. The Town Hall is a fancy construction with two-storey arcades and high gables, the 'Cage of Shame' in front of the building is noteworthy. The cathedral has an impressive collection of sacral art, about a dozen altarpieces, most famously the magnificent Gothic altar by the woodcarver Master Paul of Levoca. But again, the cathedral is only accessible with a guided tour (seems to be common in Slovakia). The small museum in the former home of Master Paul shows faithful replica of his major works and you can take a close look at the expressive faces of the carved figures. All in all it was an enjoyable visit, the WHS has enough to entertain a visitor for one or two days. Visited the castle in the mid seventies. I was on my way back from visiting a friend in Kosice heading toward Prague. It was in the middle of a full moon night, the moonlit ruins crowning the top of the mountain. I left the highway and turned into a kind of a dirt road, and camped out right there were the cross is. It was a kind of spooky, I will never forget. When the sun was up hiked up the hill and explored the eastern perimeters of the castle. I see the place has changed from a decaying structure to a fabulous historic monument. Spisska Kapitula : a majestic cathedral on a hilltop surrounded by monastic buildings, reached by bus from Levoca. Spisske Podhradie : a short walk down the hill from the cathedral, this village contains many interesting buildings. It can be accessed by train and bus. Spisske Hrad : much has been written about this magnificent building already. Spis Castle and Levoca are probably Slovakia's finest and most impressive tourist attractions. Levoca is a very pretty town with a large main square featuring several very interesting buildings, including the large Church of St. James with the altar by Master Paul. The town is surrounded by well-preserved walls. Spis Castle, or Spissky Hrad, is a fascinating and very large castle about a 25-minute drive from Levoca, partly in ruins but still an impressive sight. It is set on a steep hill and overlooks the surrounding area for many kilometres around. The castle consists of several courtyards and distinct buildings, but you have to watch your step on the slippery walkways. Very close to the castle is Spisska Kapitula, a Gothic cathedral in a religious complex that is definitely worth adding to your visit. The WH site also includes the town of Spisske Podhradie (between the castle and the cathedral) and the church in Zehra (about 3 km away). I saw both of them from a bus, but I don't think they would add a lot to the experience. The castle, the cathedral, and the town of Levoca make this a great site. The castle ruin of Spissky Hrad should - if I was the Tourist Minister - really be the logotype of the country. 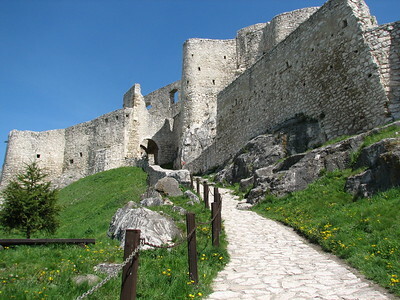 Spissky Hrad is the biggest castle ruin in central Europe and an absolute must-see for anyone travelling in Slovakia. You can spot the ruin from miles away where it sits on its hill-top, standing out like a beacon, overlooking a landscape that ends far away with the snow covered peaks of the Tatra Mountains. It is both spectacular and photogenic. The castle was built in the early 12th century by Hungarian Kings and many royal families have lived here through the years until the Csaky family took over in 1636 but quickly decided that a hill-top castle was not there type of life and instead built a modern mansion in the valley. In 1780 the castle burnt down and has been deserted ever since. Arriving to the small village of Spissky Podhradie is possible by train and the climb uphill to the castle starts more or less by the train station. It's a tough one-hour walk uphill until you reach the gates and then you still have far to climb to reach the top of the old Gothic Tower from where you have a brilliant view over the landscape. If you come by car you can cheat and drive round the back of the castle and get almost up to the eastern entrance. Finding a taxi is easier said than done in this small village though. Opposite the castle on a lower hill-top you find the Spissky Kapitula, sometimes described as the Vatican of Slovakia with its nice Cathedral and many monasteries that now has been turned into hotels or B&B's. A few kilometres away, and also included in the World Heritage, is the small church of Zehra with unique frescos from the 12th century. At the time of my visit this one was closed for refurbishing but its still a nice one from outside. A Slovak friend of mine originally from Poprad Slovakia, and living in Australia at the time told me i must visit this beautiful place. In May 2005 i saw what i can only be descibed as something out of Camelot. No sooner stepping out of the train, a one car rail car, i looked up to see a magnificent sight perched on the hill called Spissky Hrad. The view is stunning going up and from the old towers and walkways the scenic outlook is just one of the best. You could really picture yourself there a few hundred years ago. In thirty years of travelling the world i rate this the number one. The worst thing was that my trusted SLR camera, 25 years old finally called it a day, so a photographic memory will have to remind me of that great experience. This castle joins my list of what I consider the very finest of the WHSs. It is right up there with the Taj Mahal. A truly stunning ruin that is in excellent condition. This is not to say it is perfect - the is rather a lot of modern metal junk lying around in one particular part that should be removed at the earliest possible opportunity. See this place before it gets really discovered! Spissky Hrad is close to a small village named Zehra in the church of which beautiful frescoes were descovered. This church is also covered by the Unesco title. Booklets are found in English and German. As I was there (summer 2007) a lady was sitting in the church awaiting visitors. She had so much to say about the church (in English!) that we literally had to ask for permition to get out (but don't be afraid - Slovaks are extremely kind to visitors). I would definitely recommend a visit if you are at the Spissky Hrad. Another beautiful nearby town is Levoca (Leutschau) where you can admire the work of the local artist Master Paul. Don't miss the local Townhall which can also be visited from the inside. As an englishman and somewhat spoilt for choice in historic castles i was not over excited when my fiance (now wife)from Presov,suggested we visit. all that changed when Spissky Hrad came into view, it is a truly amazing structure and i do not believe i have seen a castle to match its splendour and sheer presence when viewed from afar. I presently live in Kansas City, but I was born in Slovakia. In 1996 I visited my parents who live very close to Spissky castle. One afternoon I decided to go and see the castle with my family members because I planned it for years. I took several pictures during our visit and whenever I have a chance to show them here in Kansas City to my friends or aquintances they are amazed how unique and beautiful this place is. It makes me feel good that UNESCO took notice of the castle because this "jewel" of Eastern Slovakia, so dear to my heart, is heritage not just to Slovaks but to the whole world. I am originally from Spisska Nova Ves. Its a city very close to Spissky Hrad. The view from Spissky Hrad is amazing and unforgotabe. If you ever get to visit Slovakia dont miss this magnificent part of it. I visited Spissky Hrad on a grey drisly day at the end of April of 1999. The museum wasn't open yet for the season, but they allowed us to walk around the castle. It was amazing to see. I have never been more excited to tour a building in my life. Just walking up to this huge ruin was impressive. My mother and I walked up a long muddy trail through a farmer's field, almost straight uphill through the mud to get from the town to the castle. It really made it feel like you were back in time. Not to mention you got a really great workout :) Once in the castle, you were able to wander through the various rooms and courtyards and imagine what they were like before the fire. This was my favorite part of the two months I spent in Slovakia. From "Spissky Hrad and its Associated Cultural Monuments" to "Levoca, Spissky and the Associated Cultural Monuments"
Assassinations: In a lurid sequence of events in 1700, the mayor of Levoca was accidentally wounded by a local nobleman during a hunt, generating a series of revenge attacks, finally resulting in the murder of the mayor, Karol Kramler, a Saxon magistrate. 138 Community Members have visited.